The Science International Forum (SIF) Kuwait opened the gateway to a wonderful scientific experience. After our team’s participation in Kuwait Children’s National Congress we all waited impatiently for the nail biting results. 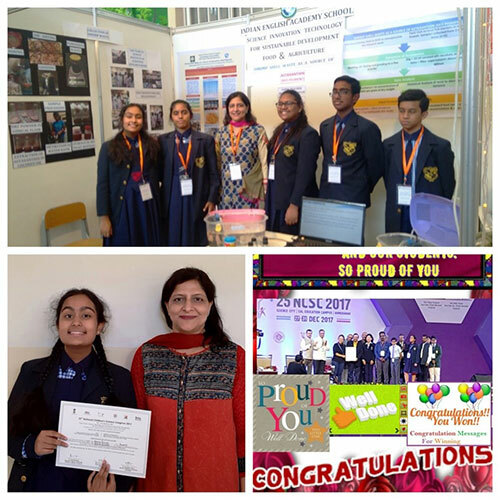 We were elated and out of words to find out that both the teams from the senior category of our very own Indian English Academy School- Kuwait had qualified for the nationals. Priyanka and I, Shaina Evanka represented each team respectively. We refined our projects and by the 25th afternoon we were all set to depart along with our teachers Ms. Bharti Takkar, Ms. Sangeetha P. Mr. Prashant Nair, the President of SIF was at the helm of the events though he couldn’t travel. 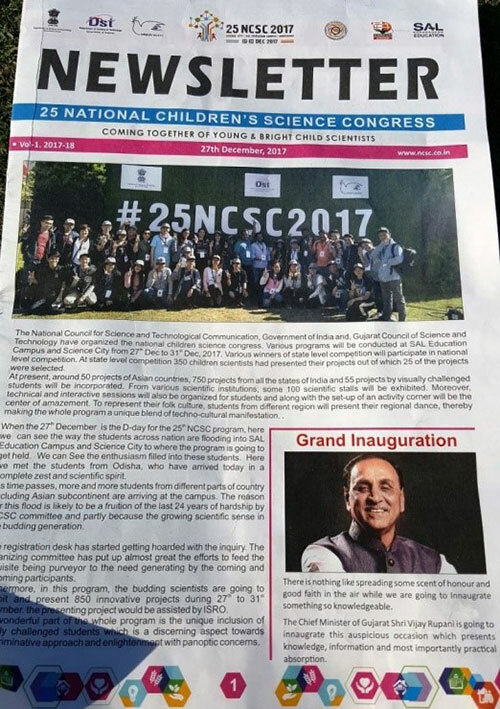 We reached Ahmedabad, Gujarat on the 26th of December for the National Children’s Science Congress (NCSC). Mr. Abga, the coordinator of the GCC welcomed the team and all were made to feel at home. The same morning, we toured Science city completed our registration formalities and received our exclusive NCSC bags which contained the newsletter for the day, several booklets, an NCSC T-shirt and NCSC snapback. Finally, the long awaited 27th of December arrived. We set out at 8:00am and reached the SAL education campus by 8:30am. It was truly a delight to see the various states of India, decked in their traditional attire shouting out their respective slogans, getting geared for the march. We also met several students from the Asian countries. We then began our grand march into the streets of Ahmedabad. It was truly a privilege to walk on the streets, holding our banners high. We marched right into science city which led us into a huge amphitheater. We were made to sit in the front rows and got a beautiful sight of the inauguration events. The event began by the organizer wishing us each in our native languages. We were warmly welcomed by scientist Dr. Sujeet Banerjee. After this, we all proceeded for the tree planting activity. This activity really made me feel close to nature and filled me with a sense of satisfaction that I had done something for mother Earth. It was followed by a short break after which we entered the vast auditorium. It was a feast for the eye as there were rockets, achievements of famous scientists, and an astronaut adorning the frontier of the auditorium. We also visited the exhibition which was going on adjacent to the auditorium. It was so very interesting to see the several inventions and views of the exhibitors. We had the honor of seeing the Chief Minister of Gujarat Mr. Vijay Rupani inaugurate and declare the event open. His speech was so valuable and inspiring to us young scientists. After this we retired to our hotel, geared with the fact that the next day was our turn to present our project and put forth our months of research work carried out under the capable guidance of Ms. Nazima and our ever supportive Tr. Bharti. We woke up very early, filled with anticipation. The D-day 28th of December arrived and we proceeded to the SAL Education Centre and almost immediately entered the building we were assigned too. We were all designated different rooms on different floors. Each room consisted of 24 students out of which I was placed at 23. Each project was very unique and interesting and was indeed a learning process in itself. Finally, it was my turn to present our paper. Even though I was nervous at the beginning, a sense of confidence overtook me when I presented our research work. The evaluators asked the simplest of questions in a very intricate manner but I was able to answer each and every question posed. After our presentation, we met our teachers who were restricted from entering the presentation room. A great wave of relief rushed over us while telling our teachers our experience and the various questions asked. We then proceeded for lunch which was followed by a team visit to the Akshardham temple. Next morning, we awaited the results. However, our names weren’t displayed on the “qualifying” list. We were a bit disappointed but satisfied with our learning experience. We proceeded with our various scientific workshops held by the NCSC itself and after a fun filled and educational experience, we went back to the hotel. On the 30th, which was our cultural day, we explored the science city. Our first stop was planet Earth- a huge life size, spherical building which consisted of all the characteristics, discoveries and phenomenon of Earth. It was truly an experience in itself! We began by venturing into the forest fires and saw how dynamos work. There were four levels. The first was the wondrous nature which consisted of forests, ocean life which consisted of huge aquariums and the coal mines. Even the children’s area was filled with little fun activities based on the principles and laws of science. We had a nail biting simulation of an earthquake too. The second level consisted of the life on earth, i.e. the Stone Age, the vast, extravagant species of animals and birds and some extinct species, the several types of minerals and rocks that exist and even the anatomy of the human body. Everything was displayed in a very explicit manner. The third level consisted of man’s intervention and the several industries built which comprised of agriculture, mineral and petrochemical based industries and the working of dams and factories. Finally, at the basement level we had a 4d simulation of the various natural disasters that occur. Soon after this breath taking experience we engaged in a shopping spree in the market. We bought little mementos for our team mates. After this, we proceeded to the Sabarmati Riverfront where we admired the picturesque view and took a few pictures. We then had to rush to the auditorium in science city as it was time for our cultural event. We quickly changed into a new pair of clothes, practiced for a while and awaited our turn in the green room. We saw the fine culture of Himachal Pradesh through their dance and also heard a melodious song sung by the state Kerala. We the GCC team put up 3 solo performances that consisted of two soothing songs and a poem and 2 group performances that consisted of a skit in Sanskrit and a dance. The cultural event was a delight. We boarded the bus, one last time, satisfied with the memories we created. It was by far one of the best days in our NCSC journey. The next day, our last day at Ahmedabad and coincidentally the last day of the year, we visited the Gandhi ashram. After starting our day in such a peaceful way, we took a rickshaw to science city for the valedictorian function. The function began with young scientists representing their respective states, decked in their national attire, singing the song “Hum Honge Kaamyab”. A panel of 6 dignitaries with an ISRO scientist as the chief guest inaugurated the event, enlightened us with speeches and inaugurated next year’s topic with a bang. We then had a moment in which each state and country’s coordinator, escorted by a young scientist, went on stage and were felicitated by the panel. Finally, it was the prize distribution event for the 15 outstanding projects. All the awardees were from different states of India. But a sudden turn of events left us spell bound. The organizer announced that for the first time in the history of NCSC, they were going to give a country outside India an award for an outstanding project as it would be unfair not to do so. I couldn’t believe my ears when my name was called out. What a proud moment indeed for me to represent my school and my team at this level of excellence in science. I ran onto the stage and received my award, delighted to have won a symbol of recognition for our team’s project “Study on the extraction and estimation of Asthaxanthin from shrimp shell waste”. What a way to enter 2018! We stood for a group photo along with our state coordinator and the backbone of our project, my teacher Ms. Bharti Takkar. My team of Elita, Gladwin, Sharlene, Kenrick, the heart of our project- Ms. Nazima, Our Principal Fr. Lionel Braganza, all my teachers and Mr. Prashant Nair were all so delighted that we were going to come into Kuwait, making our mark in NCSC. This truly was the icing on the cake. Our journey was one I’d never forget- a journey where I soaked and basked in the sea of profound scientific knowledge and research. Congratulations to your team, the Teacher Guide (Ms. Bharti Takkar), and special mention to your mentor (Dr. Nazima). 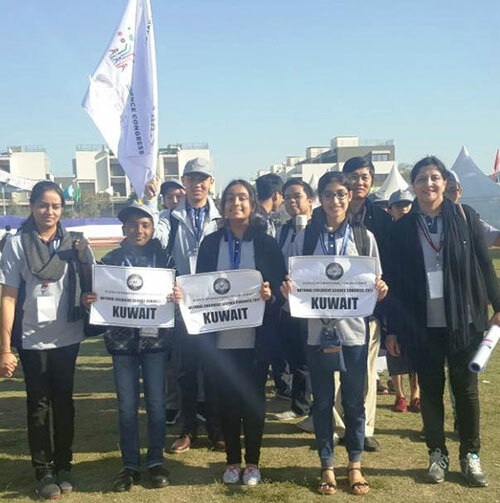 The entire Science International Forum @ Kuwait team (Mr. Prasanth Nair and team) have done an amazing job of providing you kids an excellent opportunity which they should be specially thanked and appreciated. 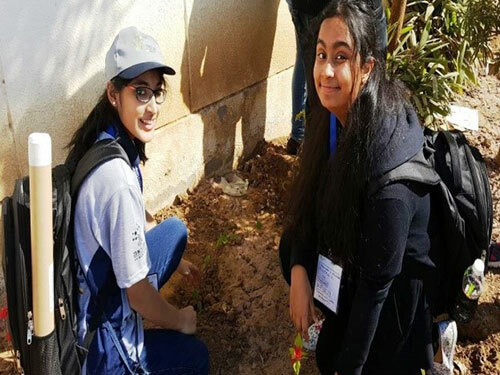 Wonderfully penned down article and appreciate your scientific caliber in the project that you had presented in Kuwait Children Science Congress and NCSC. Keep up your stupendous work and you youngsters have a great way to go in your scientific achievements. Wishing you and your team flying colors and greater achievements! God bless you all. Well written Shaina. Congratulations.. God bless.